Below we recommend which method to use. If you’re using one of the bank accounts above, we recommend connecting via direct feeds. Approval process takes about 10 business days. Transactions that you’ll receive starts from the day your connection is approved by your bank so you’ll need to upload a CSV file containing transactions taken between the start of your financial year to the day your connection is approved. Select Banking from the left menu. This will open the Bank and Cards page. If you already have an account connected click Add account in the upper right. Enter the name of you bank in the Search bar or select it from the tiles below. Click on Get direct bank feeds and then select Get direct feeds. Enter your bank and company details. Make sure they are exactly as they appear on your banking paperwork or your application may be rejected. If there are two account holders, make sure you fill in both names in the form. QuickBooks uses this information to auto-fill your Client Authority Form (CAF). Click Next and then Agree. Select the QuickBooks account you want to connect to and click Connect. Preview, print and hand-sign the form. If there are two signatories then all signatories need to sign the form. Please note that copies of the form are not accepted by banks. If your account is with NatWest or Royal Bank of Scotland, post your form to Freeport Intuit, 1 Cathedral Piazza, 1st and 2nd floors, London SW1E 5BP. If your account is with Lloyds, post your form to Lloyds Banking Group, PO BOX 1000, BX2 1LB. If your account is with HSBC, you are not required to post your form. Follow and complete the onscreen instructions. Once we receive the form, it usually takes up to 10 days to process. You can check the status of your application from the Banking page. If your bank is none of the above, we recommend connecting via standard feeds which is quick and immediate. Enter your login details that you use for online banking and select Continue. Click Agree. You may be asked to enter additional sign-in information by your bank at this stage. Simply follow the onscreen instructions as required. 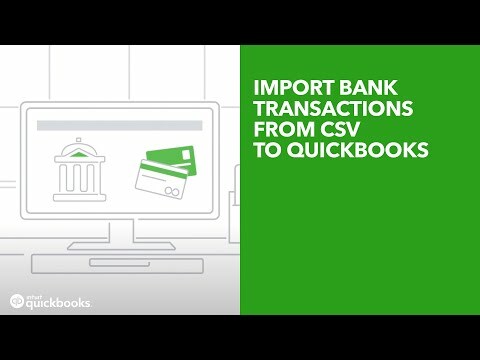 QuickBooks allows you to connect multiple accounts linked to the same account or credit card. Select the bank accounts you want to connect. The number of transactions that can be downloaded depends on the bank. If you need more transactions, refer to scenario 3. If you are setting up your QuickBooks account half way through your financial year, you’ll need to download all your transactions from the start of the financial year and import them into QuickBooks. QuickBooks requires 3 fields: Date, Description and Amount in order to successfully import bank transactions. Some banks in UK provides CSV transactions in 3 columns, and others in 4 columns (separating Amount into Debit and Credit fields). Both formats work for QuickBooks, as long as the fields are mapped correctly. All mandatory fields should be filled in. For Amount fields that doesn't have a value (normally happens to 4-column .CSV files), enter a 0. Remove all symbols in the Amount field. For example, currency sign £ or comma ,. If your Amount field is in one column, use minus sign - to depict money out rather than brackets (). Remove any non-transactional information in the file, such as account numbers, opening and closing balance. Here's how your file looks like when it's ready. In the left nav, select Banking, then File Upload. If you have connected to a bank account in the past, click on the drop-down arrow to find your File Upload option. On the File Upload page, click Browse and choose the appropriate .CSV file then click Next. From the QuickBooks Account drop-down, select the appropriate bank account you want to import your transactions to then click Next. Map the statement fields according to your .CSV file's format. Check to make sure that the date format is same as the one in your .CSV file. Most of the time it is dd/MM/yyyy for UK banks. If your CSV file separates out Amount into 2 columns, choose the 2 column option. Then, map the Debit and Credit fields. Debit field in QuickBooks mean money out and Credit for money in. When you are ready, click Next. On the next page, all transactions in your .CSV file will be displayed. If you'd like to exclude any transactions, untick the checkbox next to those transactions then click Next. Then, select Yes on the notification asking if you want to import now. Standard feed allows you to connect to your bank account to QuickBooks and download transactions immediately.